The goal of Palliative Medicine is to ease the suffering physically, emotionally, and spiritually of patients with life-limiting illness. At FEMEBA's developing Palliative Care program in Argentina, where I spent three weeks working, the suffering of terminal illness is complicated by many factors. Many of the patients seen in these clinics are dying in homes with no electricity or running water. Some are homeless, others live in shantytowns built on a garbage dump, and others live hundreds of miles from the nearest hospital or clinic and have no means of transportation. 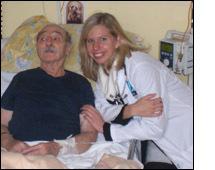 The FEMEBA program has three locations where they are currently providing Palliative Care to these very poor people. I was able to spend two weeks at Tornu hospital in Buenos Aires City in their four bed Palliative Care unit and one week at the rural unit at Sommer Hospital in General Rodriguez, Buenos Aires Providence, in their seven bed unit. Both locations also run a hospital consult service and ambulatory clinic. I was able to work in all three areas during my trip. At Tornu, I spent mornings on the consult service, rounding on patients in the hospital in need of palliation. These patients were usually in wards that held nine other patients in the same room, the beds separated by dividers. It was in one of these wards that I remember talking to a patient about his symptoms, while he looked distractedly at a volunteer walking around the unit. He got her attention and asked if she could find him a pair of pajamas, which I noticed he was wearing the next day. He didn't complain of his shortness of breath, or the pain of the cancer spreading rapidly throughout his body. For him, getting out of the jeans he had been living and sleeping in was what brought him the most comfort. In the afternoon at Tornu I saw patients in the ambulatory clinic. Some of these patients traveled hundreds of miles with intractable, severe pain, open bed sores, nausea, vomiting, and one patient with a large section of necrotic bowel herniating from his ostomy site. At Sommer hospital, I worked mostly in the inpatient unit. As Sommer was once a leprosy colony, several patients seen there had leprosy contributing to their suffering. As this unit was rural in location, the patients seen there were generally with even fewer resources than patients seen in the city. What struck me the most about my experience was that easing suffering often entailed providing basic necessities such as food and shelter. It was a wonderful, humbling experience that I would not have been able to participate in without the help of the Benjamin Josephson Foundation. I have always found it fulfilling to provide Palliation for patients, but to do it for patients who have suffered so much not just in dying but in living as well, was extraordinary.